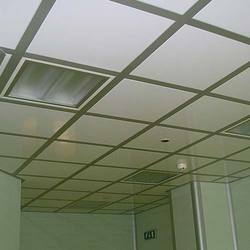 We do both grid style false ceiling and concealed false ceiling using gypsum board. The Grid will be laid on a 2" x 2" MS channel with laminated gypsum board. We are a trusted organization engaged in offering pop ceiling work to our various clients. These services are efficiently carried out by our trained professionals in several places like corporate houses, offices, MNC's, institutes and others. To ensure flawless execution of pop ceiling work, we make use of optimum quality raw material. Our company has mastered the art in providing Grid Ceiling Work. Developed by the use of unmatched quality raw materials at our vendors’ end, the provided range of Gypsum Grid False Ceiling is available as per the clients’ specific needs and demands. Our company has achieved widespread recognition in providing Grid Ceiling Work. Justifying our standing in this competitive market, we are readily engaged in the arena of offering Factory Grid Ceiling Service. In conformism with the pre-set industry set guidelines and principles, these services are enormously in demand and appreciated in the market. Being a customer-centric organization, we are offering a quality approved range of Fancy Grid Ceiling Work to our clients. Offered assortments of these services are rendered by taking the best quality basic material as per the set industry norms. Offered services are highly demanded among the clients for their timely completion and budget-friendly prices. We are prominent false celing service provider in Jaipur. Having 15 years of experince in this work we can undertake projects of any scale. Our institutional solution is well appreciated by our clients. Being a client oriented organization, we are engaged in offering a wide assortment of Grid Ceiling Services. These are deliberated and developed under the strict supervision of professionals of our vendors. Our engineers accurately design these grids and offer them to the clients with a smooth and fine finish.